Pic ex James's Facebook page. 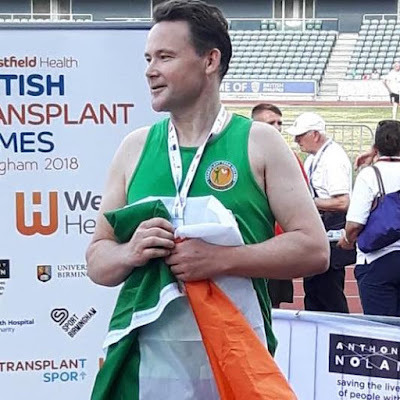 James Nolan added another athletics medal to his ever more full collection yesterday, taking a bronze in the British Transplant Games in Birmingham, writes Brian Byrne. His achievement was in the 400 Metres event at the city's Alexander Stadium in Birmingham. It was all the more satisfying as James said he had not been feeling '100pc' during the week, 'so a big Thank You to John in Berney’s Chemist for all his help'.